95 years ago, on April 23, 1920 first Turkish Grand National Assembly opened in Ankara. This was a big deal for a people who had been subjects to the Ottoman Dynasty for 600 years and who walked out of the WWI as the defeated sick man of Europe. Bright days were ahead. After a 3 year War of Independence, peace treaties were signed and Turkish Republic was established in October 29, 1923. Ataturk, founder of our nation, entrusted the future of the new republic to children. Upon his proposal, the Turkish Grand National Assembly decreed April 23 as a national holiday dedicated to children. Turkey became the first country in the world that celebrates an official Children’s Day. On April 23 of 2015, parents of all children at my son’s school gathered to celebrate this event. We crowded the seats of the theatre as our children took stage, sang songs, and performed dance theatres. Our American friends, travelers of Rick Steves’ Turkey and Istanbul groups joined the nation in this special day. 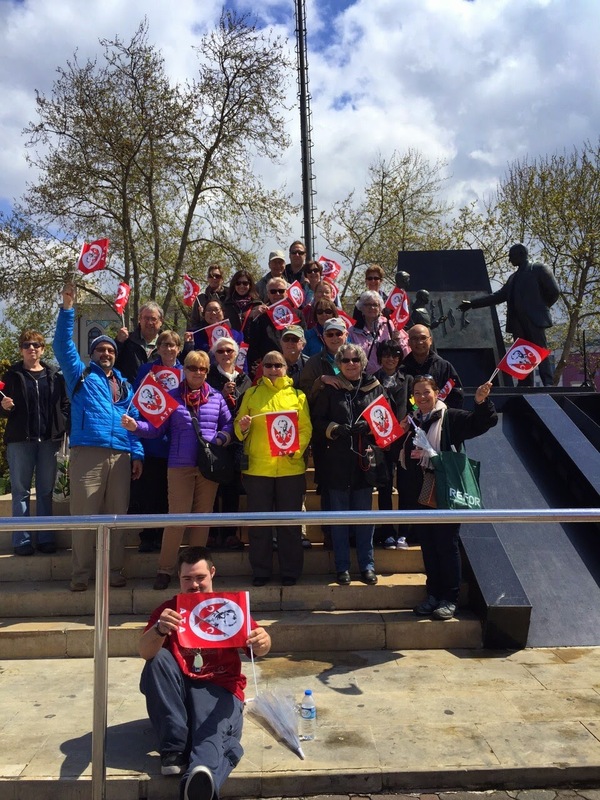 Rick Steves Istanbul group with guide Mine Karahan Taner is in front of the Ataturk statue on Asian side of Bosphorus. This statue depicts Ataturk as a teacher, it honors him as the first teacher. At the early years of the republic, Ataturk and the Grand National Assembly made several reforms, a major one was the adoption of the Latin alphabet. Following is a short and very very amateur video of recordings I took with my smart phone. I hope you can forgive the clumsiness of the production and be able to enjoy the spirit.